Natto was produced utilizing a new convenient method particularly incubation.. I have an Excalibur dehydrator with stable temperature control namely around 41 degrees centigrade.I have some Natto spores kept in the refrigerator direct from Japan. The natto spores were prepared in 200 ml of the water from the pressure cooking water cooled to about 50 degrees centigrade.This higher temperature shocks the spores to start working. A tablespoon of molasses and about 1/8 teaspoon of non-iodized salt and about 3 grams of spores was mixed together. The soy beans were mixed with the spore preparation and thoroughly mixed with a wooden spoon in a large pot. The soy beans were then placed in two Pyrex trays and furrows made to increase the bean surface area exposed. The trays were covered with plastic wrap and vent holes punched in the surface. Thee trays were then placed in the Excalibur dehydrator and the temperature monitored using a prod thermometer to be about 41 degrees centigrade for 24 hours. At 7,14,21 time intervals the soy beans were stirred in the trays to prevent local dehydration of the top layer of the beans. 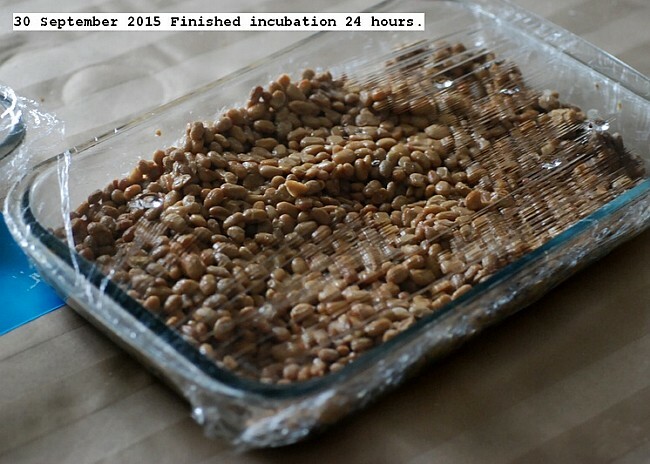 After completion of the 24 hour incubation, the beans were placed in containers and put in the refrigerator for storage. For long term storage,they may be frozen, but I intend to produce on a routine basis so normal refrigeration is sufficient,for probably ten days. All tools used in the processing were sterilized by using hot boiled water. Cleanliness is paramount to inhibit unwanted bacteria from contaminating of the desired spore process. Pictures depict the process. The finished product was reasonably good, but I would prefer more fine webs or strings. I will make another batch using around 500 grams of beans The technique is practical and easy to implement. This entry was posted in Uncategorized and tagged 30 September 2015 Natto, Making Natto at home., Natto. Bookmark the permalink.